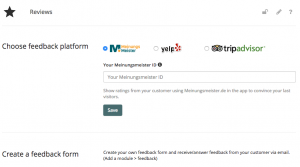 Be transparent and integrate ratings about your company from external providers (e.g. yelp or opinion leaders) into your progressive web app. Alternatively, you can create your own evaluation form and add it to the app using the pwa builder.